The Circassian genocide was the Russian Empire's ethnic cleansing, killing, forced migration, and expulsion of the majority of the Circassians from their historical homeland Circassia, which roughly encompassed the major part of the North Caucasus and the northeast shore of the Black Sea. This occurred in the aftermath of the Caucasian War in the last quarter of the 19th century. The displaced people moved primarily to the Ottoman Empire. Circassians, the indigenous peoples of this region, were ethnically cleansed from their homeland at the end of the Russo-Circassian War by Russia. The expulsion was launched before the end of the war in 1864 and it was mostly completed by 1867. The peoples planned for removal were mainly the Circassians (or Adyghe), Ubykhs, and Abaza, but Ingush, Arshtins, Chechens, Ossetians and Abkhaz were also heavily affected. Antero Leitzinger asserts that these events constituted the largest genocide in the 19th century. This expulsion involved an unknown number of people, perhaps numbering hundreds of thousands. In any case, the majority of the affected people were expelled. The Imperial Russian Army rounded up people, driving them from their villages to ports on the Black Sea, where they awaited ships provided by the neighboring Ottoman Empire. The explicit Russian goal was to expel the groups in question from their lands. Only a small percentage (the numbers are unknown) accepted resettlement within the Russian Empire. Circassian populations were thus variously dispersed, resettled, or in some cases killed en masse. An unknown number of deportees perished during the process. Some died from epidemics among crowds of deportees both while awaiting departure and while languishing in their Ottoman Black Sea ports of arrival. Others perished when ships underway sank during storms. Calculations including those taking into account the Russian government's own archival figures have estimated a loss of 90%, 94% or 95%–97% of the Circassian nation in the process. During the same period, other Muslim ethnic groups originating in the Caucasus also moved to the Ottoman Empire and Persia. In the late 18th and early 19th centuries, although it was already making attempts in the early 18th century, the Russian Empire began actively seeking to expand its territory to the South at the expense of the neighboring Ottoman and Qajar empires, and it thus aimed to incorporate the Caucasus into its domain. Some areas proved easier to incorporate than others, largely depending on the nature of local political structures. Eastern Georgia for example, comprising the most powerful and dominant Georgian regions of Kartli and Kakheti had been under intermittent Iranian suzerainty since 1555. However, upon Nader Shah's death in 1747, both kingdoms broke away from Iranian rule, and they were unified as one kingdom by the energetic Georgian king Erekle II in 1762. In 1783, Erekle and the Russians signed the Treaty of Georgievsk, by which Kartli-Kakheti formally and nominally abjured dependence on Iran, and the kingdom was declared a Russian protectorate, with prerogatives in the conduct of Georgian foreign affairs given to the Russians. By this, and the consequences of the invasion and re-subjugation of Georgia into Iran in 1795, Russia eventually found itself able, through a chain of events, to easily annex eastern Georgia in the early 19th century. This would eventually be ratified with Qajar Iran by the Treaty of Gulistan of 1813. Some territories, such as modern-day Armenia and Caucasian Azerbaijan, and southern Dagestan had powerful standing nobility, and were directly conquered in wars with Qajar Iran, namely by the Russo-Persian Wars of 1804–1813 and 1826–1828. Others, such as Lower Kabarda and areas of Dagestan, which also had powerful nobility but had remained largely independent of empires, were incorporated by co-opting the local elite and incorporating them into the Russian nobility. Both of these types of areas proved relatively easy to incorporate. In Kartli-Kakheti, as briefly described above, the Russian government used a request by the late king Giorgi XII Bagrationi for similar autonomous incorporation as a pretext for outright annexation and deposing the royal family. The ruler of Imereti militarily resisted Russia, while revolts often led by dynasty members broke out in Kartli-Kakheti, and the Georgian territories as a whole were restive for much of the 19th century. The remaining areas of the Caucasus, those that were never yet conquered by outside empires and where power was not heavily concentrated, proved the hardest for the Russians to incorporate. It was to this category that most of Circassia belonged. Circassians, Christianised through Byzantine influence between the 5th and 6th centuries were largely Christian and were often allied with largely Christian Georgia. Both Georgians and Circassians viewed themselves as a Christian island within a wider Muslim area, and both  asked for Russian protection. Although there had previously been a small Muslim presence in Circassia, significant conversions came after 1717, when Sultan Murad IV ordered the Crimean Khans to spread Islam among the Circassians, with the Ottomans and Crimeans seeing some success in converting members of the aristocracy who would then ultimately spread the religion to their dependents. However, despite the efforts of the Ottomans and their Crimean and Circassian clients, the masses of the Circassian people remained Christian and pagan, until the threat of Russian conquest impelled the majority of them to convert in order to cement defensive alliances with the Ottoman Empire and the Crimean Khanate to protect their independence. Ultimately, this led to the politicization of religion generally and Islam specifically as it created a class of Circassian nobles and clergy that were beholden to Turkish interests, while it also splintered the unity of Circassians; in the 1840s, the fact that many Circassians still remained Christian and pagan, especially among the Natuhay and Shapsug tribes, incurred the wrath of Imam Shamil's third naib, Mohammad Amin. Still today, Circassians are divided between a Muslim majority, pockets of Catholic and Orthodox Christians mainly among the Kabardins, and those who have revived the old pre-Islamic and pre-Christian religious philosophy. In Circassia, the Russians faced disorganized but continuous resistance. While Russia believed it held authority over Circassia based on the Ottomans ceding it in the 1829 Treaty of Adrianople, the Circassians considered this invalid, arguing that because their territory had been independent of the Ottomans, leaving Istanbul no right to cede it. Relations before the 19th century between the Circassians and the Cossacks had often been cordial with extensive trade, and mutual raids against the Turks and Crimeans. However, after a large influx of Cossack settlers and the construction of a long line of pickets in 1792 which cut the Circassians off from their traditional pastures around the Kuban river the Circassians and other Caucasian peoples began systematically raiding Russian encampments and then disappearing. At the same time, as more Russian troops came to be stationed in the region, their own perceived needs (due to the difficulty of shipping materials back from Russia proper) tempted them to in turn raid native villages, further enraging the natives and producing cycles of retaliation. The Circassians fought the Russians longer than all the other peoples of the Caucasus from 1763–1864. The Russian military tried to impose authority by building a series of forts, but these forts in turn became the new targets of raids and indeed a number of times the highlanders actually captured and held the forts. By 1816, Russian engagement with the Circassians made military commanders like General Aleksey Yermolov conclude that "terror" would be effective toward frontier protection instead of fortress construction as "moderation in the eyes of the Asiatics is a sign of weakness". Under Yermolov, the Russian military began using a strategy of disproportionate retribution for raids. With the goal of imposing stability and authority over the whole Caucasus, Russian troops retaliated by destroying villages where resistance fighters were thought to hide, as well as employing assassinations, kidnappings and the execution of whole families. Because the resistance was relying on sympathetic villages for food, the Russian military also systematically destroyed crops and livestock and killed Circassian civilians. Circassians responded by creating a tribal federation encompassing all tribes of the area. These tactics further enraged natives and intensified resistance to Russian rule. The Russian army was thus frustrated by a combination of highly mobile (often mounted) raiders and evasive guerrillas with superior terrain knowledge. The Circassian resistance continued, with villages that had previously accepted Russian rule often found resisting again. Furthermore, the Circassian cause began to arouse sympathies in the West, especially Britain of whom assistance was sought that came in the form of intermediaries and spies from the 1830s and during the Crimean War. More substantive British assistance never arrived as support for the Circassian cause subsided after the Crimean War as the region was considered far away from British concerns. Imam Shamil in the Northeast Caucasus, meanwhile, had tried to win over their support for his own struggle against Russia on numerous occasions, but the Circassians were largely cold toward his overtures. After he surrendered to Russia, their resistance continued unabated. The Russians countered the heavy Circassian resistance by modifying the terrain. They laid down a network of roads and cleared the forests around these roads, destroyed native villages, and often settled new farming communities of Russians or pro-Russian Caucasian peoples. In this increasingly bloody situation, the wholesale destruction of villages became a standard tactic. In 1837, the leaders of the Natukhai, Abzakhs and Shapsugs offered submission and voluntary incorporation into the Russian Empire, if Russian and Cossack forces would be withdrawn to beyond the Kuban river; however their offer was ignored, and the unilateral seizure of Circassian lands continued, with thirty-six new Cossack stanitsas established by 1840. General Yermolov remarked that "We need the Circassian lands, but we don't have any need of the Circassians themselves". Russian military commanders, such as Yermolov and Bulgakov, acting in their own interests to attain glory on the battlefield and riches through conquest, which would be much more difficult to attain on the Western front than in the Caucasus, often deceived the central administration and obscure the facts when Circassian groups were trying to establish peace with Russia. In the negotiations to formulate the Treaty of Paris and end the Crimean War, the British representative, the Earl of Clarendon, insisted that the Kuban river should be the boundary between Russia and Turkey, which would place Circassia outside of Russian rule, but he was undermined by the French and Turkish representatives which supported Russian ownership of Circassia. When Clarendon then tried to make the treaty state that Russia couldn't build forts in Circassia, he was again thwarted by the French representative. The final treaty also extended amnesty to nationals that had fought for enemy powers, but since Circassia had never previously been under Russian control, Circassians were exempt, and thus Circassians were now placed under de jure Russian sovereignty by the treaty, with Russia under no compulsion to grant Circassians the same rights as Russian citizens elsewhere. In 1857, Dmitry Milyutin first published the idea of mass expulsions of Circassian natives. Milyutin argued that the goal was not to simply move them so that their land could be settled by productive farmers, but rather that "eliminating the Circassians was to be an end in itself – to cleanse the land of hostile elements". Tsar Alexander II endorsed the plans, and Milyutin later would become the minister of war in 1861, and from the early 1860s expulsions began occurring in the Caucasus (first in the Northeast and then in the Northwest). Others among the Russian military class such as Rostislav Fadeyev expressed views that the Circassians were unable to become Russian as a "re-education of a people is a centuries-long process" and that Russia was at a pivotal moment in its history toward pacifying the Caucasus. To achieve those ends Fadeyev stated that Russians intended to "exterminate half the Circassian people in order to compel the other half to lay down their arms". Sentiments for expulsion existed among prominent Russian politicians such as Prince Kochubei. Kochubei said to Americans visiting the region that "these Circassians are just like your American Indians – as untamable and uncivilized... and, owning to their natural energy of character, extermination only would keep them quiet." However, even before Milyutin's 1857 proposal, in 1856 Russian forces had already been evicting Crimean Tatars and Nogais, and this has been connected to the Circassian evictions by some authors such as Rosser-Owen. As Russian armies advanced in Circassia in the late 1850s and early 1860s, Circassians were evicted from their lands so they could be settled by loyal Cossacks as the Russian military elite developed a belief that Circassians would have to be entirely expelled from regions for the security of Russian rule. For her own part, Russia was eager to get rid of "unquiet" peoples and settle the area with Cossacks and other Christians. General Nikolai Yevdokimov advocated expelling the natives of the Western Caucasus to the Ottoman Empire. He wrote that "resettlement of intractable mountaineers" to Turkey would be the easiest way to bring the prolonged Caucasian War to an end, while giving freedom to those who "prefer death to allegiance to the Russian government". On the other hand, the Tsarist command was very much aware of the possibility of the migrants being used by Turkey as a strike force against Christian populations during the impending Russo-Turkish War. The Circassian resettlement plan was eventually agreed upon at a meeting of the Russian Caucasus commanders in October 1860 in Vladikavkaz and officially approved on May 10, 1862 by Tsar Alexander II. The Ottomans sent emissaries to encourage emigration. The Ottomans hoped to increase the proportion of Muslims in regions where there were large Christian populations. Mountaineers were invited to "go to Turkey, where the Ottoman government would accept them with open arms and where their life would be incomparably better". Local mullahs and some chiefs favored resettlement, because they felt oppressed by the Russian administration. They feared that in order to gain full Russian citizenship they would have to convert to Christianity. Additionally, local chieftains were keen to preserve their ancient privileges and feudal rights that had been abolished throughout the Russian Empire by the Emancipation Manifesto in 1861. The obligatory conscription was also among the factors that worried these populations, although in fact they would never have been made subject to military draft. Mainly, those Circassian chiefs who favoured resettlement came from the Abzakh tribe who moved their people to new lands in the north from where they previously lived. It is from the Abzakh tribe that most of the remaining Circassians stem from and comprise the titular nation of the modern day Adygei Republic in Russia. Other Circassian chiefs from different tribes who were also gathered at a meeting (1861) with Tsar Alexander II in the Russian town of Yekaterinodar, and promised to accept Russian rule if Cossacks and Russian soldiers were removed from Circassia, beyond the Kuban and Laba rivers. The Russians rejected the Circassian proposal. Those chiefs[which?] refused Russian proposals to move their people out of their ancestral lands. In 1859, three years before the approval of the plan by the Russian government, Russian officials began talks with the Ottomans about the migration of a limited number of emigrants, and in 1860 they two sides negotiated a treaty for the migration of 40,000-50,000 Circassians, with the Ottoman side being eager for an increase in population. At this time, however, numerous Circassians around the Kuban and even Kalmyks had already been expelled to Ottoman lands as the Russians had swept them up in their systematic deportation of Nogais, with British newspapers reporting that Russian forces were forcing a choice of either the Ottoman Empire or Siberia on resident Nogai and Circassian populations, with 18000-20000 Circassians and Nogais ended up packed densely together outside the cities of Istanbul and Üsküdar. With a gathering sense of emergency, on 25 June 1861, leaders of all the Circassian tribes and the Ubykhs gathered in a khase in Sochi to jointly petition the Western powers for help. Ottoman and British delegations both promised recognition of an independent Circassia, as well as recognition from Paris, if they unified into a coherent state, and in response the Circassian tribes formed a national parliament in Sochi, but Russian General Kolyobakin quickly overran Sochi and destroyed it, while there was no action to stop this by any major power's government. In 1862, the proposal to deport the Circassians was ratified by the Russian government, and a flood of refugee movements began as Russian troops advanced. General Yevdokimov was entrusted with enforcing the Russian policy of mass Circassian migration to other parts of the Russian Empire or the Ottoman Empire. Along with Cossack cavalry and mobile units of riflemen Yevdokimov penetrated unconquered northern areas of Circassia and Circassians there submitted without resistance. Four thousand families from those areas left their homeland around the Kuban river estuary and departed for the Ottoman Empire. In the south east Circassians prepared to resist Russian military advances and troops. With the refusal to surrender, Circassian tribes were targeted one by one by the Russian military with thousands massacred and whole villages razed to the ground. Parade by Russian troops, symbolizing the end of the Caucasian War at a military encampment in Qbaada, May 21, 1864. In 1864 in the valley of Khodz, near Maikop the Ubykh population resisted Russian troops. During the battle the men were joined by the women who disposed of their jewellery into the river and took up arms into a fight to the end and to have an honourable death. Russians troops with heavy artillery and contentious gunfire from modern weaponry killed all the men, women and children that a Circassian chronicler witness to the events described the scene of Circassian dead that "swam in a sea of blood". In a canyon near Sochi called Qbaada locally[clarification needed], the Circassian forces and some of their Abkhaz allies made their last stand against the Russian army in May 1864. The place was renamed Krasnaya Polyana, meaning "red meadow" in Russian for all the blood that had been spilt there, when it was later resettled by ethnic Russians in 1869. After the final battle in 1864, hordes of Circassians were driven to Sochi, where thousands of them died as they awaited deportation. Although some Circassians went by land to the Ottoman Empire, the majority went by sea, and those tribes which had "chosen" deportation were marched to the ports along the Black Sea by Russian forces. Russian commanders and governors warned that if the order to leave was not carried out, more forces would be sent. Among the main peoples that moved to Turkey were Adyghe, Ubykhs, Muslim Abkhazians – hence the reference in the name to the deportation being of Circassians. The Shapsugh tribe which numbered some 300,000 were reduced to 3,000 people of whom managed to flee into the forests and plains. The 140 Shapsugh that remained were sent to Siberia. Overall, calculations including those taking into account the Russian government's own archival figures as well as Ottoman figures have estimated a loss of 90, 94% or 95–97%  of the Circassian nation in the process. The population of some (but not all) of the Ubykhs as well as the various major subdivisions of the Circassian (Adyghe) people, the main targets of the operation, before the war and five years after the operation have been calculated as follows:. However, although Circassians were the main (and most notorious) victims, the expulsions also gravely affected other peoples in the region. It was estimated that 80% of the Ingush left Ingushetia for the Middle East in 1865. Lowland Chechens as well were evicted in large numbers, and while many came back, the former Chechen Lowlands lacked their historical Chechen populations for a long period until Chechens were settled in the region during their return from their 1944–1957 deportation to Siberia. The Arshtins, at that time a (debatably) separate people, were completely wiped out as a distinct group: according to official documents, 1366 Arshtin families disappeared (i.e. either fled or were killed) and only 75 families remained. Additionally, in 1860–1861 the Russian army forced a series of evictions in lands in the Central Caucasus, forcing about 10,000 Kabardins, 22,000 Chechens and additionally a significant number of Muslim Ossetians out and to Turkey. Two other Muslim peoples in the northwest Caucasus, the Karachay and the Balkars, were not deported in large numbers during the process. Abkhazia, meanwhile, lost 60% of its population[clarification needed] by the end of the 19th century. Whether sources treat the evictions of these non-Circassian peoples as a part of the same process varies; most sources include the evictions and massacres of the Ubykh (considered by many to be part of the Circassian ethnos despite having a different language ) and Abazin populations as part of the same operation against the neighboring ethnic Circassian populations, and some sources also include the Abkhaz in counts of the evicted  while others group the expulsions of Chechens, Ingush, Arshtins  and Ossetians  with those of Kabardins, and also some include the earlier and less systematic expulsions of Nogai. The 1861 order by Yevdokimov the relocate populations of Circassians (including Ubykhs) to the swamps also included the Nogais and Abazas. Shenfield has argued that those that died in the ensuing catastrophe were probably more than a million, likely approaching 1.5 million. Walter Richmond describes the situation of Circassian refugees as representing one of the first modern crises of a stateless people. "I shall never forget the overwhelming impression made on me by the mountaineers in Novorossiisk Bay, where about seventeen thousand of them were gathered on the shore. The late, inclement and cold time of the year, the almost complete absence of means of subsistence and the epidemic of typhus and small pox raging among them made their situation desperate. And indeed, whose heart would be touched on seeing, for example, the already stiff corpse of a young Circassian women lying in rags on the damp ground under the open sky with two infants, one struggling in his death-throes while the other sought to assuage his hunger at his dead mother's breast ? And i saw not a few such scenes." An unknown number of deportees perished during the process. Some died from epidemics among crowds of deportees both while awaiting departure and while languishing in their Ottoman Black Sea ports of arrival. Others perished when ships underway sank during storms or due to cases where profit-minded transporters overloaded their ships to maximize monetary gain. In order to pay for the voyage, Circassians sometimes were forced to sell their cattle, their belongings, or themselves into slavery. "the Turkish skippers… like cargo threw anyone who showed the slightest sign of illness overboard. The waves threw the corpses of these unfortunate souls onto the shores of Anatolia… Scarcely half of those who set out made it to their goal"
"Why did it happen that ... the Abzakhs and Shapsugs, who were being driven from their homeland, suffered such horrific sufferings and deaths? It was exclusively because of the hurried and premature movement of our troops to the sea prior to the spring equinox. Had the Dakhovsky Detachment moved a month or two weeks later, this would not have happened"
Despite the conditions, Russian forces under Yevdokimov kept driving Circassians to the coast. In January he annihilated Ubykh auls, leaving the Ubykhs without shelter in the severe winter, and in March, the crowd of refugees at the Circassian port of Tuapse approached twenty thousand. "Dense masses of ragged men, women, and children literally covered the sea shore. All looked wan and hungry. Many were all but naked. Several lay dying…"
In 1864, the Ottoman Porte repeatedly asked the Russian government to stop the deportations on humanitarian grounds, in light of the human disaster unfolding on their shores, but the Ottoman requests were repeatedly refused as Yevdokimov argued with urgency that the deportations should instead by accelerated. When October 1864 was chosen as a cutoff point for the departures, Yevdokimov successfully got it delayed two weeks, after which he ignored the deadline and deported without stop Circassians even as winter set in again. Later in 1867, Grand Prince Mikhail Nikolaevich stated that the cleansing had had to be accelerated "in light of a possible European coalition". With regard to Ottoman policy overall, historian Walter Richmond accuses the Ottoman government of "playing a double game", "gross irresponsibility" and being "either unconcerned with or oblivious to the consequences immigration would have for the refugees, by having at various points encouraged Circassian population movement", in its previous statements, having earlier encouraged immigration, urging the Circassians to "stay and fight" in late 1863 and promising the arrival of an international coalition force, and then encouraging another wave of immigration as late as June 1864 when the human costs were beyond clear, while Shenfield also describes the Ottoman response to the crisis as "grossly inadequate" and Marc Pinson accuses the Ottoman government of not trying to formulate a coherent policy toward the refugees. Richmond also argues that the British, despite serious discussion of the possibility of military intervention to alleviate the situation in Circassia, of having ultimately been concerned only with their own geopolitical interests and "deserting" Circassia to its fate. Rosser-Owen, meanwhile, portrays both London and Istanbul as having been constrained by pragmatic concerns, at a loss for what to do about the flood of refugees, and notes the hardships suffered by British consular staff as they tried to help the Circassian refugees as well as the improvement of Ottoman policy toward accommodating the refugees over time so that by 1867 when the final Abkhaz refugees were transported, there were much fewer deaths in the process. Whereas Richmond argues that Western European indignation at the unfolding situation in Circassia arose only after Russia leveraged the Porte to gain special rights in the Dardanelles thus threatening their trade interests, Rosser-Owen emphasizes that the philanthropic efforts of British organizations and that the concern for the well-being of Circassians was most intense in Scotland where Circassian struggles were compared to past traumas in then-recent Scottish history. Commanders of Russian troops in the Western Caucasus: Infantry General Count Nikolai Yevdokimov (left), Governor of the Caucasus and Grand Duke Mikhail Nikolayevich (centre), and Major General D.I. Svyatopolk-Mirsky (right) at Qbaada, 21 May 1864. Although the order given by Tsar Alexander II was to deport the Circassians rather than to massacre them, the Russian commanders were open to the idea of massacring large portions of the Circassian population, and General Fadeyev wrote that the Russian command decided "to exterminate half the Circassian people to get the other half to lay down their arms." Richmond has noted that "reports abound" of massacres in the final stages of the Caucasus campaign. In April 1862, when a group of Russian soldiers slaughtered hundreds of Circassians who had run out of ammunition, leaving "the mountain covered with corpses of bayoneted enemies", as reported by Ivan Drozdov. Often, the Russian military preferred to indiscriminately bombard areas where Circassians were residing. In June 1862, after the Circassian auls of a part of the Kuban region were burned down and the Circassians fled into the forest, General Tikhotsky's men proceeded to bombard the forest. In September 1862, after bombarding a Circassian aul and seeing its inhabitants flee into the forest, General Yevdokimov bombarded that forest for six hours straight. Ivan Drozdov claimed to have overheard Circassian men were taking vows to sacrifice themselves to the cannons to allow the rest of their auls to escape, and later reports groups of Circassians doing so. By the fall of 1863, Richmond argues that Russian operations had become "methodical and thorough", following a formula by which, after the Circassians fled into the woods, their aul, the livestock rounded up and any food that could be found would be burned, then after a week or two they would search for and destroy any huts the Circassians might have made for shelter, and then this process would be repeated until General Yevdokimov was satisfied that all the natives in the area had either died or fled. In May 1864, the coastal tribes of Pskhu, Akhtsipsou, Aibgo and Jigit were defeated in battle and then killed en masse to the last man, woman and child, after which, on 21 May, Prince Mikhail Nikolayevich gathered the troops in a clearing in the area for a thanksgiving service. As the deportations increased, there were not enough Ottoman and Russian vessels to carry all the deportees, even when Ottoman and Russian warships were recruited for the job, and the situation began taking a heavy toll on Ottoman treasuries, as the Ottomans bore the brunt of the task. Initially, on 17 May 1863, Tsar Alexander II ruled that "those who chose to emigrate" should pay their own way. Later, the Russians offered financial incentives for vessels to take the Circassians to Ottoman ports, but forced the Circassians themselves to pay part. In some cases, Circassians were forced to sell their cattle or their belongings to pay, in others, one out of every thirty Circassians was sold into slavery to pay. These funds ultimately ended up in the hands of the transporters, including Russian military officers  Many vessels refused to carry Circassians because of the disease that was present among them as many of the ships that had been carrying Circassians had had their crews fall ill, while others that did agree tried to make as much profit out of it as possible by overloading their vessels with refugees, ultimately causing many transport boats to sink, killing their human cargo. In April 1864, after one Russian crew was entirely wiped out by disease, Russian vessels stopped offering themselves for transport, dumping the entire process onto the burden of the Ottomans; although Yevdokimov investigated the possibility of hiring more ships, he made no effort to make provisions for food, water or medical help. At least one Russian source from 1908 said that special commissions were set up by the Russian imperial authorities to reduce mortality rates and "survey needs of the migrants", that is, to prevents ships from being overloaded, to profitably auction bulky movables, and to prepare clothes and victuals for the poorest families, which would be transported "without fee or charge of any kind". The Russian consul based in the Ottoman Black Sea port of Trabzon reported the arrival of 240,000 Circassians with 19,000 dying shortly thereafter with the death rate being around 200 people per day. On 25 May 1864, Henry Bulwer, the British ambassador in Istanbul, argued that the British government charter some of its own vessels for the purpose because the Ottomans simply did not have enough on their own; the vessels were not forthcoming but British government ships provided assistance at various points and British steam ships also helped. On 29 May, eight Greek vessels were reported to be helping with the transportation of Circassians, as were one Moldavian, one German, and one British vessel. In 1862, the Circassians sent a delegation of leaders to major cities in Britain, which had been covertly helping the Circassians with tactics and with organizing their resistance, visiting major English and Scottish cities including London, Manchester, Edinburgh and Dundee to advocate for their cause. The visits caused a swelling of public support for the Circassians and outrage directed at Russia, with sympathies particularly intense in Scotland perhaps due to the recent Highland Clearances, and sparked lobbying for intervention by the Dundee Foreign Affairs Committee, calls to arms for the defense of Circassia, the founding of the Circassian Aid Committee in London, and constant reporting on the issue by various newspapers such as The Scotsman. Politicians and newspapers began taking up the "Circassian cause", and calling for intervention to save Circassia from decimation, and at one point Parliament came close to going to war with Russia and attempting to establish a protectorate over struggling Circassia. Although such initiatives failed to change British government policy, the Circassian Aid Committee, organized by many individuals who were angry at inaction by London, managed to gather 2067 pounds for the provision of mattresses, blankets, pillows, woolens and clothings especially for Circassian orphans in Istanbul, while Russophobic commentary by some of its members has been attributed for its closing in March 1865. British consuls became involved with relief patterns and the organization of resettlement for Circassians, with various British consuls and consular staff catching illnesses from plague-ridden Circassian refugees, and a few died from such illnesses. In the initial stages of the process, relief efforts were also made by the Ottoman population, both by Muslims and Christians. In Vidin, in Bulgaria, the Muslim and Christian inhabitants volunteered to increase their grain production and send it to the local Circassian refugees, while in Cyprus, the Muslim population sheltered Circassian orphans. The Ottoman government built mosques for them and provided them with hocas, while the Sultan donated 50,000 pounds from his Privy Purse, although there were some reports in the British press that most of this money did not actually end up helping Circassian refugees, having been embezzled by Ottoman officials at various steps along the way. As the burden of the refugees increased however, sentiments against the refugees, particularly among the Bulgarian and Turkish populations, grew and tensions began to develop between the Bulgarian and Turkish natives and the Circassian refugees. Now with God's help, the matter of complete conquest of the Caucasus is near to conclusion. A few years of persistent efforts are remaining to utterly force out the hostile mountaineers from the fertile countries they occupy and settle on the latter a Russian Christian population forever. The honor of accomplishing this deed belongs mainly to the Cossacks of the Kubanski armed forces. As early as 1857, Dmitry Milyutin remarked that "our obligations to the human kind require that we take anticipatory measures to provide for the existence of even those tribes that are hostile to us, having been ousted from their own lands on account of public necessity". The Ottoman authorities often failed to offer any support to the newly arrived. They were settled in the inhospitable mountainous regions of Inner Anatolia and were employed on menial and exhausting jobs. Shamil's son Muhamed Shafi was appalled by the conditions the migrants had faced upon their arrival to Anatolia and went to investigate the situation: "I will write to Abdülmecid that he should stop fooling mountaineers... The government's cynicism could not be more pronounced. The Turks triggered the resettlement by their proclamations, probably hoping to use refugees for military ends... but after facing the avalanche of refugees, they turned turtle and shamefully condemned to slow death those people who were ready to die for Turkey's glory". In 1864 alone about 220,000 people disembarked in Anatolia. Between March 6 and May 21, 1864, the entire Ubykh nation had departed the Caucasus for Turkey, where they linguistically vanished. By the end of the movement, more than 400,000 Circassians, as well as 200,000 Abkhazians and Ajars, fled to Turkey. The term Çerkes, "Circassians", became the blanket term for them in Turkey because the majority were Adyghe. Some other Circassian refugees fled to the border areas of the Danube Vilayet where Ottomans had expanded their military forces to defend the new province and some Circassians enrolled in military service while others settled in the region. The Ottoman authorities often opted to settle Circassians in Christian-majority regions that were beginning to clamor for independence, as a loyal counterweight population to the rebellious natives. These places had just recently taken on large numbers of around a hundred thousand Crimean Tatar refugees, in a previous resettlement operation that had also seen widespread complications and problems  In Varna, it was reported that the situation was particularly bad, with 80,000 Circassians settled on the outskirts of the city in "camps of death" where they were unprotected from weather or disease and left without food. When Circassians tried to beg for bread, Turkish soldiers chased them out for fear of the diseases they carried. It was reported that the Turks were unable to keep up with burying Circassian corpses, and recruited convicts to do the work as well; one Circassian wrote to the Governor General "We rather go to Siberia than live in this Siberia ... one can die, not live, on the indicated place". In 1861–1862 alone, in the Danube Vilayet, there were 41,000 Circassian refugee families. By the end of the process, there were around 250,000 Circassians in the Balkans, accounting for 5 to 7 percent of the total Balkan population, on top of the earlier arrival of 100,000 Crimean Tatars that Balkan populations had just recently had to absorb. Kadir Natho notes that "a net of Circassian settlements enveloped practically all the European part of the Ottoman Empire". Very large numbers of Circassians were settled in Bulgaria. Istoria Bulgarii reports that "about 6,000 families were transferred through Burgas and settled in Thrace; 13,000 families-- through Varna and Shumen -- to Silistra and Vidin; 12,000 families to Sofia and Nish. The remainder 10,000 families were distributed in Svishtovsk, Nikipolsk, Oriskhovsk, and other outskirts." There was a chain of Circassian settlements stretching from Dobrudja to the Serbian border, with an additional cluster of 23 settlements in the Kosovo field. Circassians also settled in a few mostly Greek areas, particularly in the southern part of Epirus, Cyprus and one colony at Panderma in the Sea of Marmara. Kadir Natho lists the following areas as having notable concentrations of Circassian refugee settlements : "in spacious Anatolia... near Amasya, Samsun, Cilicia, Mesopotamia, on the Charshamba peninsula, along the Aegean Sea, in Turkish Armenia, Adapazar, Duzge, Eskisehir, and Balikesir. From Trebizond the mountaineers were directly sent to Kars and Erzincan... many exiles were distributed in... the vilayet of Sivas, on the extensive desert between Tokat and Sivas". Many Circassian households petitioned the Russian embassy in Constantinople for their resettlement back in the Caucasus. By the end of the century, the Russian consulates all over the Ottoman Empire were deluged with such petitions. Later, re-emigration was sanctioned only on a limited scale, as mostly large villages (up to 8500 inhabitants) applied for re-emigration and their relocation posed formidable difficulties to the imperial authorities. Perhaps more importantly, Alexander II suspected that Britain and Turkey had instructed Circassians to seek return with the purpose of sparking a new war against their Russian overlords. As a consequence, he was known to personally decline such petitions. See articles "Circassians", "Adyghe" and "Ubykh" for more details. The overall resettlement was accompanied by hardships for the common people. A significant number died of starvation — many Turks of Adyghe descent still do not eat fish today, in memory of the tremendous number of their kinfolk that they lost during the passage across the Black Sea. Some of the deportees and their descendents did well and they would eventually earn high positions within the Ottoman Empire. A significant number of Young Turks had Caucasian origins. All nationals of Turkey are considered Turkish for official purposes. However, there are several hundred villages which are considered purely "Circassian", whose total "Circassian" population is estimated to be 1,000,000, although there is no official data in this respect, and the estimates are based on informal surveys. The "Circassians" in question may not always speak the languages of their ancestors, and Turkey's center-right parties, often with varying tones of Turkish nationalism, generally do well in localities where they are known to constitute sizable parts of the population (such as in Akyazı). Along with Turkey's aspirations to join the European Union population groups with specificities started receiving more attention on the basis of their ethnicity or culture. In Middle Eastern countries, which were created from the dismembered Ottoman Empire (and were initially under British protectorate) the fate of the ethnos was better. The Al Jeish al Arabi (Arab Legion), created in Trans-Jordan under the influence of Lawrence, in significant part consisted of Chechens — arguably because the Bedouin were reluctant to serve under the centralized command. In addition, the modern city of Amman was born after Circassians settled there in 1887. Apart from substantial numbers of Kabardian Circassians consisting of qalang tribes, small communities of mountainous Circassians (nang tribes) remained in their original homeland under Russian rule that were separated from among one another within an area heavily resettled by Russian Cossacks, Slavs and other settlers. For example, the capital of the Shapsugh tribe was renamed after the Russian general that committed atrocities in the region along with the erection of a victory statue to him. In the Caucusus, some 217,000 Circassians remained in 1897. Misha Glenny notes that the settlement of the Circassian deportees played a major role in destabilizing the Ottoman Balkans, especially Bulgaria. Their arrival helped spread starvation and epidemics (including smallpox) in the Balkan territories, and worse, the Porte ordered that Christians be evicted en masse from their homes in certain areas in order to accommodate the need to house the deportees. This, and the outbreak of armed conflict between the Circassians and the Christian and Muslim natives, accelerated the growth of nationalist sentiments in the Balkans. Kadir Natho argues that the Ottomans coopted the Circassians into a "police force" in the Balkans as well as settling them to increase the local Muslim population, with Circassians being made to take arms against rebellions, even those Circassians that had not settled in affected regions. The local Balkan peoples, having just taken on large numbers of Crimean Tatar refugees, an operation which had caused the deaths of thousands of refugees and natives alike due to disease and starvation, were loathe to take in more Muslim refugees expelled by the Russians, and some Bulgarians in particular were convinced that Circassians had been placed into scattered Bulgarian villages "in order to paralyze any kind of liberation and independence Slavic movement". While in many areas, Bulgarian Christians had initially been very hospitable to the Circassian refugees, including by producing extra resources to support them, the collapsing humanitarian situation combined with the political instability caused relations between the two groups to spiral downward. In many cases, lands were assigned to North Caucasian refugees by the Ottoman government, but the locals refused to give up their homes, causing outbreaks of conflict between Circassians and Chechens on one side, and the Bulgarian, Serbian, Arab, Bedouin, Druze, Armenian, Turkish and Kurdish natives on the other, causing the outbreak of armed conflict. In Uzun Aile, between Kayseri and Sivas, Circassians ultimately pushed the local Kurdish population out, and to this day the Kurds with roots in that region recall in a folk song how a "cruel fair-haired and blue-eyed people with sheep-skin hats" drove them from their homes. Traumatized, desperate, and having lived for many decades previously in a situation where Circassians and Russians would regularly raid each other, Circassians sometimes resorted to raiding the native populations, ultimately causing a reputation for the Circassians as being particularly barbaric to spread throughout the Empire. Eventually, fear of the Circassians, due to the diseases they spread and the stereotype of them as either beggars or bandits, became so great that Christian and Muslim communities alike would protest upon hearing that Circassians were to be settled near them. In recent times, scholars and Circassian activists have proposed that the deportations could be considered a manifestation of the modern day concept of ethnic cleansing, though the term had not been in use in the 19th century, noting the systematic emptying of villages by Russian soldiers that was accompanied by the Russian colonization of these lands. They estimate that some 90 percent of Circassians (estimated at more than three million) had relocated from the territories occupied by Russia. During these events, and the preceding Caucasian War, at least hundreds of thousands of people were "killed or starved to death", but the exact number is still unknown. Former Russian President Boris Yeltsin's May 1994 statement admitted that resistance to the tsarist forces was legitimate, but he did not recognize "the guilt of the tsarist government for the genocide." In 1997 and 1998, the leaders of Kabardino-Balkaria and of Adygea sent appeals to the Duma to reconsider the situation and to issue the needed apology; to date, there has been no response from Moscow. In October 2006, the Adygeyan public organizations of Russia, Turkey, Israel, Jordan, Syria, the United States, Belgium, Canada and Germany have sent the president of the European Parliament a letter with the request to recognize the genocide against Adygean (Circassian) people. On July 5, 2005 the Circassian Congress, an organization that unites representatives of the various Circassian peoples in the Russian Federation, has called on Moscow first to acknowledge and then to apologize for tsarist policies that Circassians say constituted a genocide. Their appeal pointed out that "according to the official tsarist documents more than 400,000 Circassians were killed, 497,000 were forced to flee abroad to Turkey, and only 80,000 were left alive in their native area." The Russian parliament (Duma) rejected the petition in 2006 in a statement that acknowledged past actions of the Soviet and previous regimes while referring to in overcoming multiple contemporary problems and issues in the Caucasus through cooperation. There is concern by the Russian government that acknowledging the events as genocide would entail possible claims of financial compensation in addition to efforts toward repatriating diaspora Circassians back to Circassia. On May 21, 2011, the Parliament of Georgia passed a resolution, stating that "pre-planned" mass killings of Circassians by Imperial Russia, accompanied by "deliberate famine and epidemics", should be recognized as "genocide" and those deported during those events from their homeland, should be recognized as "refugees". Georgia, which has poor relations with Russia, has made outreach efforts to North Caucasian ethnic groups since the 2008 Russo-Georgian War. Following a consultation with academics, human rights activists and Circassian diaspora groups and parliamentary discussions in Tbilisi in 2010 and 2011, Georgia became the first country to use the word "genocide" to refer to the events. On 20 May 2011 the parliament of the Republic of Georgia declared in its resolution that the mass annihilation of the Cherkess (Adyghe) people during the Russian-Caucasian war and thereafter constituted genocide as defined in the Hague Convention of 1907 and the UN Convention of 1948. The next year, on the same day of May 21, a monument was erected in Anaklia, Georgia, to commemorate the suffering of the Circassians. "Yes, I believe that the concept of genocide against the Circassians was justified. To understand why we are talking about the genocide, you have to look at history. During the Russian-Caucasian war, Russian generals not only expelled the Circassians, but also destroyed them physically. Not only killed them in combat but burned hundreds of villages with civilians. Spared neither children nor women nor the elderly. The entire fields of ripe crops were burned, the orchards cut down, so that the Circassians could not return to their habitations. A destruction of civilian population on a massive scale is it not a genocide?" In Russia, a presidential commission has been set up to "counter the attempts to falsify history to the detriment of Russia" with respect to the events of the 1860s. Author Arno Tanner argues that, by its manner of suppression of the Caucasus directed at the Crimean Tatars and Circassians, the expulsions can be credited with "inventing the strategy of modern ethnic cleansing and genocide". Paul Henze, meanwhile, credits the events of the 1860s in Circassia with inspiring the Armenian Genocide at the hands of the Ottoman Empire, to whose lands the Circassians had been deported. Walter Richmond also argues the term "genocide" is appropriate, considering the events of 1864 to have been "one of the first examples of modern social engineering". Citing international law which holds that "genocidal intent applies to acts of destruction that are not the specific goal but are predictable outcomes or by- products of a policy, which could have been avoided by a change in that policy", he considers the events to have been genocide on the grounds that the ensuing demographic transformation of Circassia to a predominantly ethnically Russian region was viewed as desirable by the Russian authorities, and that the Russian commanders were fully aware of the huge number of deaths by starvation that their methods in the war and the expulsion would bring, as they viewed them as necessary for their supreme goal that Circassia be firmly and permanently Russian territory, all the while viewing Circassia's native inhabitants as "little more than a pestilence to be removed". Alan Fisher notes that accurate counts of the refugees were difficult to impossible to obtain because "Most of those leaving the Caucasus did it in a hurry, in a disorganised fashion, without passing any official border point where they might have been counted or officially noted", however estimates have been made primarily based on the available documents  including Russian archival documents  as well as Ottoman documents. Between November 1863 and August 1864: over 300,000 Circassians seek refuge in the Ottoman Empire; over two-thirds die. ^ Richmond, Walter (2013). The Circassian Genocide. Rutgers University Press. back cover. ISBN 978-0-8135-6069-4. ^ a b c d e f g h i j k l Ahmed 2013, p. 161. ^ Leitzinger, Antero (14 December 2004). "The Circassian Genocide". Global Politician. Archived from the original on 9 November 2013. ^ King, Charles. The Ghost of Freedom: A History of the Caucasus. p. 95. . One after another, entire Circassian tribal groups were dispersed, resettled, or killed en masse. ^ a b "145th Anniversary of the Circassian Genocide and the Sochi Olympics Issue". Reuters. 22 May 2009. Retrieved 28 November 2009. ^ a b Barry, Ellen (20 May 2011). "Georgia Says Russia Committed Genocide in 19th Century". The New York Times. ^ a b Sarah A.S. Isla Rosser-Owen, MA Near and Middle Eastern Studies (thesis). The First 'Circassian Exodus' to the Ottoman Empire (1858–1867), and the Ottoman Response, Based on the Accounts of Contemporary British Observers. Page 16: "... with one estimate showing that the indigenous population of the entire north-western Caucasus was reduced by a massive 94 per cent". Text of citation: "The estimates of Russian historian Narochnitskii, in Richmond, ch. 4, p. 5. Stephen Shenfield notes a similar rate of reduction with less than 10 per cent of the Circassians (including the Abkhazians) remaining. (Stephen Shenfield, "The Circassians: A Forgotten Genocide? ", in The Massacre in History, p. 154.)" ^ a b Richmond, Walter. The Circassian Genocide. Page 132: ". If we assume that Berzhe’s middle figure of 50,000 was close to the number who survived to settle in the lowlands, then between 95 percent and 97 percent of all Circassians were killed outright, died during Evdokimov’s campaign, or were deported." ^ "Caucasus Survey". Archived from the original on 15 April 2015. Retrieved 23 April 2015. ^ a b King, Charles. The Ghost of Freedom. pp. 37–39. ^ King, Charles. The Ghost of Freedom: A History of the Caucasus. pp. 27–30. ^ a b c d Shenfield 1999, p. 150. ^ Natho, Kadir I. Circassian History. Page 147. ^ Richmond, Walter. The Circassian Genocide. Page 59: "Shamil's third naib, Muhammad Amin, arrived during the Adagum Zafes and gained the allegiance of most Circassian tribes in less than a year. He frequently resorted to military force to ensure the loyalty of 'peaceful' tribes such as the Egerukay, Mahosh, and Temirgoy, and to coerce Shapsugs and Natuhays who had not adopted Islam into abandoning paganism and Christianity." ^ King, Charles. The Ghost of Freedom: A History of the Caucasus. pp. 92–93. ^ King, Ghost of Freedom, 80. ^ King, The Ghost of Freedom, p73-76. p74:"The hills, forests and uptown villages where highland horsemen were most at home were cleared, rearranged or destroyed... to shift the advantage to the regular army of the empire."... p75:"Into these spaces Russian settlers could be moved or "pacified" highlanders resettled." ^ Natho, Kadir I. Circassian History. Page 357. ^ Richmond, Walter. Circassian Genocide. Page 17: "The mentality of the Caucasus military command was shaped by people who behaved as if they were in charge of their own country, which outsiders couldn’t understand. Contemptuous of their superiors in St. Petersburg, they fabricated whatever story suited their needs. Furthermore, they adopted Tsitsianov’s view that conquest was the only viable option for control of the region. As we’ll see, when civilian administrators used peaceful methods, the military commanders undermined them both by petitioning St. Petersburg and by launching raids into Circassia to sow animosity. This continued all the way up to the 1860s, when Field Commander Nikolai Evdokimov sabotaged St. Petersburg’s final attempt to reach a settlement with the Circassians. "; Page 18: "The troubles Atazhukin faced were also typical of Circassians who understood the magnitude of the threat posed by Russia and who sought a peaceful solution. The Russian military command disliked all such peacemakers and did all they could to thwart their efforts. Many Circassians likewise distrusted their compatriots who sought peace with Russia, and they worked to undermine their credibility in Circassia. This would be the fate of all so- called peaceful Circassians— threats from the Russian side and attacks from the Circassian side. More importantly, all proposals from figures such as Atazhukin that cut to the heart of the Circassian position— that they wanted to be good neighbors with the Russians, not subjects of the tsar— were dismissed out of hand by both the Caucasus command and St. Petersburg." ; Page 20-21: " “For the generals,” Vladimir Lapin writes, “the activity of diplomats, who were creating post- Napoleonic Europe, essentially meant farewell to their hopes of receiving further rewards.”43 There was more to it, though. Even if war in Europe were to break out again, the campaign of 1812 made it clear that Russia would suffer enormous losses even if victorious. On the other hand, Asia’s military backwardness would make victory and glory easy. Even before he arrived in the Caucasus, Ermolov wrote, “We can’t take a step in Europe without a fight, but in Asia entire kingdoms are at our service.”44 Ermolov reveled in his overwhelming firepower against which his opponents—particularly the mountaineers of Chechnya, Dagestan, and Circassia—were powerless to combat: “It is very interesting to see the first effect of this innocent means [cannons!] on the heart of man, and I learnt how useful it was to be possessed of the one when unable all at once to conquer the other.”45 In his quest for personal glory, Ermolov chose adversaries (victims might be a more appropriate term) who stood no chance against his superior weaponry, and he employed levels of brutality and inhumanity as yet unseen in the Caucasus. It worked, too: Ermolov’s officers were decorated and promoted as their tactics became more devastating. Subsequent generations would emulate Ermolov’s form of success." ^ Conacher. Britain and the Crimea. pages 203, 215– 217. ^ a b c d King, Charles. The Ghost of Freedom: A History of the Caucasus. Page 94. In a policy memorandum in of 1857, Dmitri Milyutin, chief-of-staff to Bariatinskii, summarized the new thinking on dealing with the northwestern highlanders. The idea, Milyutin argued, was not to clear the highlands and coastal areas of Circassians so that these regions could be settled by productive farmers...[but] Rather, eliminating the Circassians was to be an end in itself – to cleanse the land of hostile elements. Tsar Alexander II formally approved the resettlement plan...Milyutin, who would eventually become minister of war, was to see his plans realized in the early 1860s. ^ a b L.V.Burykina. Pereselenskoye dvizhenie na severo-zapagni Kavakaz. Reference in King. ^ Richmond 2008, p. 79. "In his memoirs Milutin, who proposed deporting Circassians from the mountains as early as 1857, recalls: "the plan of action decided upon for 1860 was to cleanse [ochistit'] the mountain zone of its indigenous population.". ^ Rosser Owen, Sarah A. S. Isla (2007). "The First ‘Circassian Exodus’ to the Ottoman Empire (1858–1867), and the Ottoman Response, Based on the Accounts of Contemporary British Observers". Page 16: "Moreover, the Crimean and Nogay Tatars were already being evicted to the Ottoman Empire from as early as 1856, and so the fate of the Circassians can be seen as belonging to part of a wider policy of forced (or induced) exile." ^ Rosser-Owen (2007). "The First 'Circassian Exodus' to the Ottoman Empire (1858–1867)". Pages 15–16: "As it advanced, the Russian Army began systematically clearing the Circassian highlands of their indigenous inhabitants, often in particularly brutal and destructive ways, and replacing them with settlements of Cossacks, who they deemed to be more reliable subjects... there was a general feeling within Russian military circles that the Circassians would have to be entirely removed from these areas in order to fully secure them." ^ Richmond, Walter (2013). "Circassia: A small nation lost to the Great Game". In Laban Hinton, Alexander; La Pointe, Thomas; Irvin-Erickson, Douglas. Hidden genocides: Power, knowledge, memory. Rutgers University Press. p. 114. ISBN 978-0-8135-6164-6. ^ Кумыков Т. Х. Выселение адыгов в Турцию - последствие Кавказской войны. Нальчик. 1994. Стр. 93-94. ^ РГВИА. Ф. 400. Оп. 1. Д. 1551. ^ Напсо Д. А., Чекменов С. А. Надежда и доверие. Из истории дружественных связей народов Карачаево-Черкесии с русским народом. Черкесск. 1993. Стр. 111. ^ a b c d e f g h i Shenfield 1999, p. 151. ^ Rosser-Owen (2007). 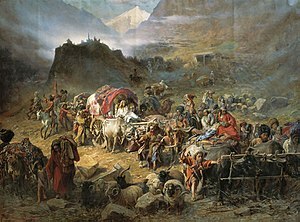 "The First Circassian Exodus". Page 15: "Although the Russian Government did not give the plan official sanction until May 1862, in 1859 they had already started talks with the Ottomans to provide for a limited number of Circassian migrants. " ^ ‘Turkey’, The Scotsman, January 9, 1860, p.3. Cited in Rosser-Owen (2007), "The First Circassian Exodus", page 18. ^ Rosser-Owen (2007). "The First Circassian Exodus". Page 18: "One such missing detail is that there is not only evidence of significant migrations occurring in 1859, but in fact there is also evidence of the forced deportation of Circassians occurring at this time when some of the northern tribes around the Kuban area appear to have been caught up in the expulsion of the Nogay Tatars, alongside whom many of them had lived, and as the Russians advanced south. The refugees of this period were a particularly mixed bunch, with a number of groups were being pushed towards the coast by an advancing Russian Army, and one report in January 1860 even observed a group of Kalmyks arriving in Istanbul." ^ "The First Circassian Exodus". Page 18: "By the time of his letter in January 1860, it was estimated that 18,000-20,000 refugees were now “packed together in the damp khans of Scutari and Stamboul”"
^ a b c Ahmed 2013, p. 162. ^ a b Shenfield 1999, p. 152. ^ Richmond, Walter. The Circassian Genocide. p. 2. ^ "Caucasus and central Asia newsletter. Issue 4" (PDF). University of California, Berkeley. 2003. Archived from the original (PDF) on 2008-02-27. ^ "Chechnya: Chaos of Human Geography in the North Caucasus, 484 BC – 1957 AD". www.semp.us. November 2007. Archived from the original on 2010-12-20. ^ a b Jaimoukha, Amjad. The Chechens: A Handbook. Page 259. ^ Rosser Owen, Sarah A. S. Isla (2007). "The First Circassian Exodus". ^ Mal’bakhov, Kabarda v Period ot Petra I do Ermolova, page 237. ^ Shenfield, Stephen D (1999). "The Circassians: A Forgotten Genocide". In Levine, Mark D and Penny Roberts, Massacres in History. Page 154: "The number who died in the Circassian catastrophe of the 1860s could hardly, therefore, be less than one million, and may well have been closer to one-and-a-half million"
^ a b Ahmed 2013, pp. 162–163. ^ Drozdov, Ivan. "Posledniaia Bor’ba s Gortsami na Zapadnom Kavkaze". Pages 456-457. ^ a b ‘The Circassian Slave Trade’, The Scotsman, August 30, 1864, p.4. Cited in Rosser-Owen (2007), "The First Circassian Exodus"
^ Rosser-Owen, Sarah A. S. Isla. "The First Circassian Exodus". Page 22: "The deportations were not conducted with any kind of efficiency on the part of the Russians, with the Circassians often left to find unchartered transports, which also left them open to abuses by the captains of the vessels." ^ King, Charles. The Ghost of Freedom: A History of the Caucasus. pp. 96–97. ^ Mikhail Nikolaevich to Novikov, September 20 (OS), 1867, Georgian State Archive (Tbilisi), f. 416, op. 3, doc. 160, 2. ^ Richmond, Walter. The Circassian Genocide. Page 81. ^ Field notes of Evdokimov for June–December 1863, available from the Georgian State Archives, Tbilisi. f.416, op. 3, doc. 1177, 100-190 passim. ^ Richmond, Walter. Circassian Genocide. Page 86: "Not only refugees but entire crews were wiped out. After a Russian captain and crew met this fate in April, the Russians refused to transport any more on state- owned ships and left the rest of the deportation to the Turks and private vessels.46 Evdokimov investigated the possibility of hiring ships to transport the Circassians, but his quibbling over fees delayed the exploitation of private boats for several months.47 However, he apparently requested no food, water, or medical help." ^ Кумыков Т. Х. Op. cit. Стр. 15. Лакост Г' де. Россия и Великобритания в Центральной Азии. Ташкент. 1908. Стр. 99-100. ^ a b c d Ahmed 2013, p. 163. ^ Rosser-Owens (2007). "The First Circassian Exodus". Page 23: "As the deportations increased, Russian, Ottoman, and even British vessels were chartered to convey the refugees in what must have itself been a massive operation... the burden of the operation landed on the shoulders of the Ottoman Government and the transporting of refugees took a huge toll on Ottoman finances, leading to a suggestion by Sir Henry Bulwer, British Ambassador at Istanbul, that the British Government either allocate a loan or agree to charter British merchant steamers to be used for this purpose." In footnote: "Neither the loan nor the transports were forthcoming on this occasion, although the British did provide transports at various points, and independent steamers also transported refugees"
^ Unsigned report, May 17 (OS), 1864, Georgian State Archive (Tbilisi), f. 416, op. 3, doc. 146, 1– 2. ^ Rosser-Owen, Sarah A.S. Isla. "The First Circassian Exodus". Page 46: "With the Highland Clearances still fresh in the minds of many, the Circassian issue seems to have generated particular sympathy in Scotland. One frustrated letter sent in to The Scotsman reflects this sentiment: “The Scotchmen whose ancestors fought and bled for their national liberty over and over, are they to meet and talk and do nothing at the call of both freedom and humanity, or instead of being first, to be last? If they are, they are unworthy of the blessings they themselves enjoy… why not call a public meeting, and appoint a committee to receive contributions?”"
^ Rosser-Owen (2007). "The First Circassian Exodus". Page 38: "One private letter sent to The Spectator magazine from Dr Sandwith in Gratz claimed that out of the £50,000 given for the aid of the refugees, only £1,000 had actually reached them, accusing Ottoman officials of having each stolen a share along the way". Author notes later that the figure of 49,000 embezzled is probably not a "reliable estimate". ^ Напсо Д. А., Чекменов С. А. Op. cit. Стр. 113-114. ^ Quoted from: Алиев У. Очерк исторического развития горцев Кавказа и чужеземного влияния на них ислама, царизма и пр. Ростов-н/Д. 1927. Стр. 109-110. ^ Glenny, Misha (2000). The Balkans, 1804–1999: Nationalism, War and the Great Powers. Granta Books. p. 96. ISBN 978-1-86207-073-8. ^ РГВИА. Ф. 400. Оп. 1. Д. 1277. Л. 2-3. ^ Richmond, Walter (2013). Circassian Genocide. Page 103. ^ Думанов Х. М. Вдали от Родины. Нальчик, 1994. Стр. 98. ^ Дзидзария Г. А. Махаджирство и проблемы истории Абхазии XIX столетия. 2-е изд., допол. Сухуми. 1982. С. 238, 240–241, 246. ^ Glenny, Misha. The Balkans: Nationalism, War and the Great Powers, 1804–1999. pp. 96–97. ^ Richmond, Walter. The Circassian Genocide. p. 1. ^ Kullberg, Anssi; Christian Jokinen (19 July 2004). "From Terror to Terrorism: the Logic on the Roots of Selective Political Violence". The Eurasian Politician. Archived from the original on 22 December 2007. ^ a b c Richmond 2008, p. 172. ^ Hildebrandt, Amber (2012-08-14). "Russia's Sochi Olympics awakens Circassian anger". CBC News. Retrieved 2012-08-15. ^ Грузия признала геноцид черкесов в царской России // Сайт «Лента.Ру» (lenta.ru), 20 May 2011. ^ Tanner, A. The Forgotten Minorities of Eastern Europe – The History and Today of Selected Ethnic Groups in Five Countries. East-West Books. 2004. ^ McCarthy, Justin. "Factors in the Analysis of the Population of Anatolia" in Population History of the Middle East and the Balkan. Ahmed, Akbar (2013). The Thistle and the Drone: How America's War on Terror Became a Global War on Tribal Islam. Washington, D.C.: Brookings Institution Press. ISBN 978-0-8157-2379-0. Richmond, Walter (2013). "The Circassian Genocide". Rutgers University Press. Retrieved 3 May 2016. Shenfield, Stephen D. (1999). "The Circassians: A Forgotten Genocide?". In Levene, Mark; Roberts, Penny. The Massacre in History. New York: Berghahn Books. pp. 149–162. ISBN 978-1-57181-935-2. Richmond, Walter (2008). The Northwest Caucasus: Past, Present, Future. London: Routledge. ISBN 978-1-134-00249-8. This page was last edited on 19 April 2019, at 06:23 (UTC).